THE MASSIVE EUROPE-BASED BUSWORLD series of events has launched its latest global franchise right on Australasia’s doorstep – at the Jakarta International Expo (JIEXPO) Kemayoran, Jakarta, Indonesia - scheduled for March 20–22, 2019, it’s reported recently. Busworld South-East Asia will be held in Jakarta, Indonesia - right on Australia's doorstep - March 20–22, 2019. With new Prime Minister of Australia Scott Morrison expected to briefly visit the capital city Jakarta this Thursday to, aside from any unforeseen hurdles, announce an in-principle free trade deal - as reported by the national broadcaster’s website www.abc.net.au today - a few key local bus and coach companies have confirmed to ABC magazine confidentially a strong intent to attend the show next year, given the huge bus business and export potential. Busworld organisers confirm exhibition space bookings are now open. According to Busworld (the original Busworld Kortrijk event was held every two years in Belgium), the Indonesian premises are the perfect place for an international exhibition, adding to its global suite of eight events that includes: Europe (Belgium), Turkey, India, Russia, Latin America (Colombia), Asia (China), Central Asia (Kazakhstan) and now South East Asia (Indonesia). Busworld decided to organise a new exhibition in Indonesia because of the promising bus and coach market there, as well as in its neighbouring countries. The exhibition is organised together with Global Expo Management (GEM), which already has thorough experience with exhibition organisation and the commercial vehicle industry, it’s stated. Indonesia has a population of some 260 million people (40 per cent of the ASEAN population) spread over 34 provinces with 415 districts. 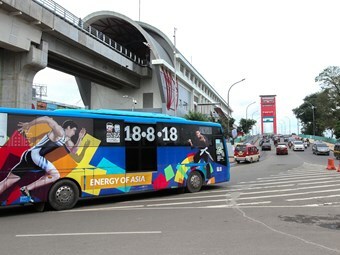 Due to traffic congestion by cars, the government of Indonesia is continuously improving the public transport system with, for example, a Bus Rapid Transit system in Jakarta, Yogyakarta, Solo and other provinces, Busworld says. The Indonesian Ministry of Transportation has planned for procurement of 3,000 new BRT system buses in the 34 provinces by 2019, it’s stated. In addition, the current bus fleet is old and needs renewal, organisers say. The Ministry of Transportation is in the process of regulating the maximum ages; for buses the maximum age will be 25 years and for tourism coaches 10 years. According to police records there are more than 500,000 buses in operation on the road with 35 per cent of them aged over 20 years old. This would mean that Indonesia will need 175,000 units of new buses in the coming years, it’s calculated. Most interestingly, Indonesia is also aiming to reach 20 million visitors by the end of 2019, it’s stated. Ten new destinations are ready now for tourists and, in order to serve this larger number of visitors, forecasters say there is a need for 5,000 new coaches by 2019, confirms Busworld. Additionally, coach tourism is "the next big thing in Indonesia", the massive industry organisation says. Since 2016 coach operators also started to introduce double-decker coaches. All these factors combine to indicate that Indonesia is a perfect place to host a Busworld exhibition, it’s believed. Didier Ramoudt, president of Busworld International, is convinced about this location: "I am sure that the Indonesian bus and coach market is ready for a specialised professional bus-and-coach-only exhibition and conference." "Although the bus and truck industry might be linked through their similar technologies, the markets are completely different. "The bus and coach industry deserves a separate targeted approach. Together with GEM Indonesia, we will make this happen!" he explained. The exhibition is supported by IPOMI, the association of Indonesia’s young bus operators and ASKARINDO, the association of bodybuilders.